With a new push to build more homes in the UK and particularly homes that people can afford to buy rather than million pound riverside penthouses the time is now to provide some data on the broadband situation for new premises built across the UK. February saw the latest ONS postcode data set released (previous set was August 2017) and we ingested this in February and while the task of determining what services are available to all the new postcodes is not totally finished we have resolved new premises to give a very good idea of what is being delivered in January 2018 and across the whole of 2017. 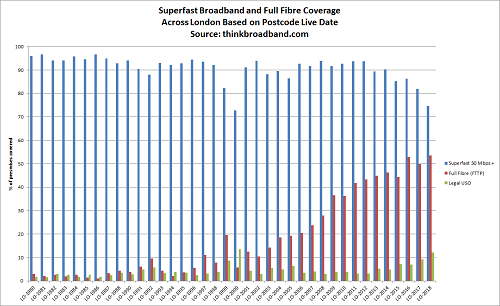 The immediate take away is that new premises are being built and between 1 in 4 and 1 in 5 are appearing without access to superfast broadband, and with the main bulk of the BDUK contracts now finished, the number of new homes built each year is going to put into jeopardy aims to reach 97-98% superfast coverage. The levels of full fibre (FTTP) coverage are much higher in new premises compared to the 3.5% across the UK, but even so 35.5% coverage for the new premises we have found from January 2018 feels low compared to the rhetoric of the last year around delivering full fibre to new premises. The identification of premises only includes those in new postcodes, so small developments and flat conversions are not likely to be reflected in these figures. The data also does not include those postcodes where we have not determined the number of premises present or what broadband options are available, therefore we expect the number of premises for the UK 2017 set to continue to increase with perhaps another 40,000 to add in the next month. The situation is highly variable and we have found some estates where premises built in 2016 are waiting on a VDSL2 cabinet going live but new premises built in late 2017 are going live with full fibre. What is clear from our data is that a lot of new premises are slipping through the commercial broadband roll-out nets and Government and planning authorities need to address this now, otherwise the periodic stories in the press about people buying new homes and being stuck with slow broadband will continue. It is impossible to imagine 1 in 4 new homes being built with access to mains water and it should be the same with superfast broadband. While our main table presents the UK wide picture, the situation varies considerably once you drill down to the regional level (we have data at the local authority level if there are specific requests for an area), London is clearly at the vanguard of the full fibre push due to the competition between Openreach and Hyperoptic mainly but areas like the East Midlands look to be behind the full fibre curve. 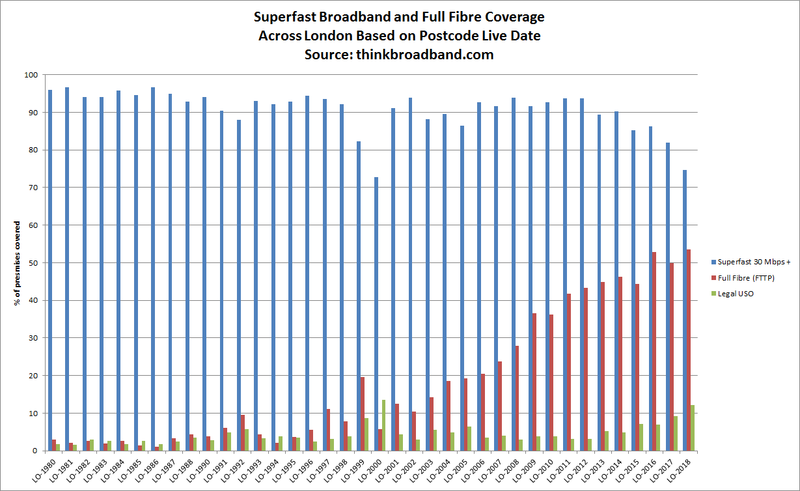 There is a worrying trend in both of these graphs in that as more full fibre is available the levels of superfast coverage for premises built in each year seems to drop. 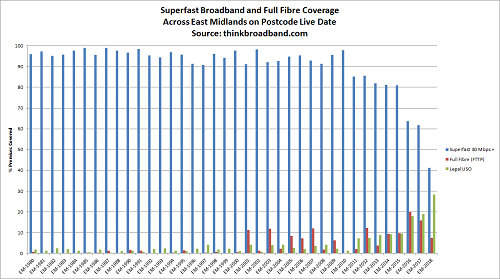 In the East Midlands we may have only found 834 new premises in the January 2018 period but it should worry the authorities that only 40% have access to superfast broadband, now it may be that work on delivering full fibre or VDSL2 is not live for them yet but given how the levels are still only reaching 80% for premises built in 2014 it is easy to see why so many who have bought a new home are complaining. 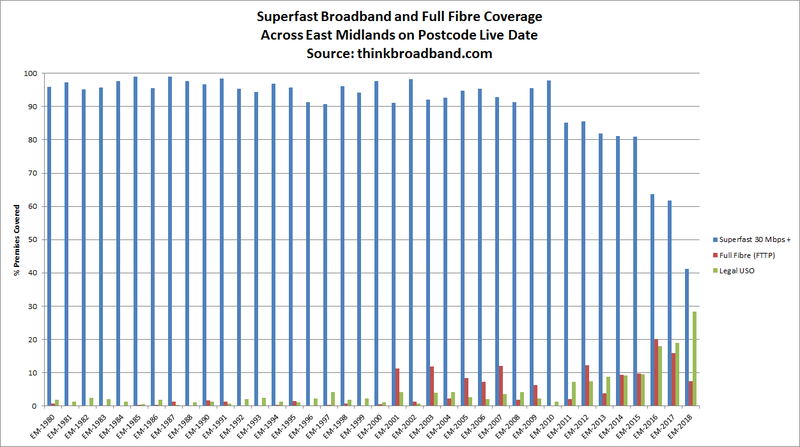 We announced that the UK had reached 95% superfast coverage back on 29th January and the pace of roll-outs from the BDUK projects was already starting to tail off then and this does not look like a blip caused by the Christmas holidays as the number of new VDSL2 cabinets we are finding going live is a lot smaller than in the close of 2017 and so once you add the expansion our UK premises count from 28,914,859 premises on 28th January to 29,004,880 on 4th March mainly due to the new build premises you can see that there is a possibility of slipping below a UK wide 95% level. To date the roll-outs that continue are just about keeping ahead so we have gone from 95.0079% to 95.0335%. According to Openreach - "99% of plots on New Sites of 30+ premises contracted since April 2017 will get FTTP"
If they 'engage' is a caveat I recall and it may be that there is more FTTP to go live and thus improve the figures, but the 99% of plots does seem to give a false picture. Of course it may be those contracted since April 2017 are still to have actual premises built, such is the house building market that what you plan in 2017 only gets sold in 2019. I do believe the numbers given by Openreach are correct, but remember that this number is basically developers signing up to the FTTP offer in the first place. I think further digging should be done to find out why certain new builds are not getting decent broadband. I suspect some developers are not going through the process and correctly registering for the FTTP offer (you have to register at least 9 months before you want Openreach to provide the first service). The planning regulations ought to have been amended some time ago to make this a requirement for all significant developments just as they have to for other infrastructure services. A major housing development would never go ahead unless the local electricity distribution and water companies had sufficient capacity. Developers often have to contribute to uplifts (as they might do for roads & schooling). Compared to this, the costs of providing SF or even UF broadband is peanuts. Note, scattered developments of a few units is a different matter but surely less statistically significant. I moved into a 165 house new build in 2015, 2nd household. Despite VM cables within 30 feet from site they weren't there, 6 weeks to get a phone (2 missed appointments by OpenReach), a further week for ADSL. Over the next 2 years speed dropped from 14 to 11 mbits (shocked surprise by ISP at set line speed which they promptly reduced after line dropouts when speed had dropped to 12 mbits). After just over 27 months FTTC arrived and suppliers insisted on new contract (as already under contract) so no options but to stay - no offers etc. I assume the builder wouldn't pay anyone. Left a bad taste. @thinkbroadband You can't make this stuff up ! @ TheEulerID - I think it's a complete failure of the government to not ensure that superfast broadband is a part of building regulations. This should have been implemented a number of years ago as broadband these days is as vital a utility as water and electricity. Given that the decision on what broadband if any to deploy to new sites is in the hands of developers, do you have the information to name and shame the worst offenders? A league table showing those failing to cover the most premises would be a great thing to publish. Given money to employ another body or two to take the data and chase down which developer (remember some new builds involve multiple developers) and confirm what has or has not or is under construction then yes a league table of Developer vs Developer is possible. Anybody want to start a Gov.uk petition to ask for planning permission to mandate FTTP?? you would need 4, England, NI, Wales and Scotland as it is devolved. ( eg Wales mandated sprinklers in all new builds although I know it is not enforced! whereas the others don't). I tried one years ago about solar heating / power before the 100k forcing a debate arose. I can only echo the article's headline. Moved into a new build home 2012 and get 5Mbps speeds if lucky. I realise for some this is good but it made me envious when seeing adverts for upto 38Mbps downloads which I cannot get at my cabinet which Openreach will not upgrade and which I subsequently learned seems to owned/run by WarwickNet a business catering for broadband to industrial estates where my house is across the road from. Will try WarwickNet to see if they supply residential customers.